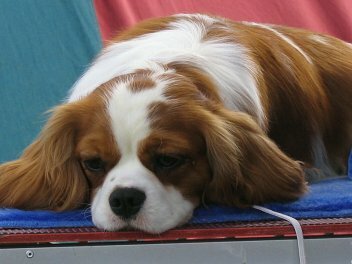 Charlie: Is an Australian & New Zealand Champion as well as a Toy Specialty Best in Show winner. Outside of the show ring he is an all round great dog, enjoys going for a swim and loves nothing better that a game of fetch with a toy, ball or stick. 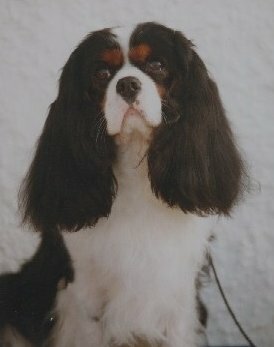 Freddie: a truly neat wee dog and a very good producer. 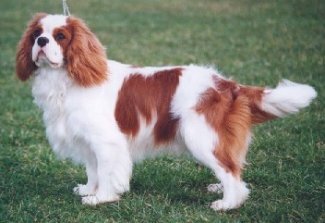 An all round unflappable dog and his puppies also have fabulous temperaments. He gained half the points required in both Australia and New Zealand to gain the respective Championship titles however due to circumstances beyond our control was not campaigned fully in either country. Sadly and tragically we lost Freddie very suddenly in mid 2006. A dog that had never had a sick day in his life up until falling ill very quickly and fatally. Boris: would have to be the unluckiest dog around when it relates to showing. 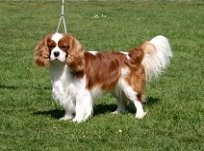 He has won a Cavalier Specialty Best in Show, a Cavalier Specialty Res BIS and a Toy Specialty Res BIS and yet only has two of the eight challenge points required to become a Champion. Unfortunately our all rounder judges do not appreciate or understand the finer points of the breed and penalise him for his heavy blanket markings. Harry was initially only owned by Dianne however due to his at that time rather exuberant and noisy personality he came to stay with us. He enjoys the Nidra lifestyle of wide open spaces and combined with a change of diet is now a more calmer and quieter dog. It was very exciting to receive a text while we were visiting the US from a very excited Beth Warman (Corsair) to say that Harry had not only gained his 8th CC to become a Champion but he had gone Res BISS under Marilyn Claydon, Brymarden Kennels, UK. 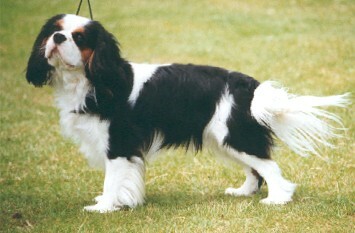 Harry has recently been residing with Beth and the famous Corsair Cockers, Americans and Bichons. Harry and Beth make a great team and have won numerous Best of goups. Dianne and I are deeply indebted to Beth and the Warman family for the wonderful care they have given Harry. Jake: Our rising star we hope, along with his litter sister Nidra Fortuitously with Prestonville. 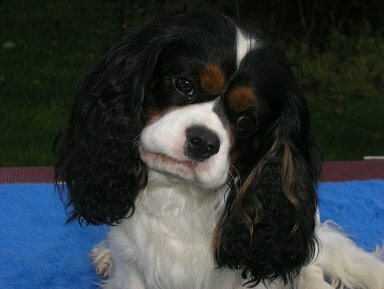 Jake is a sweet man with that wonderful gentle Cavalier temperament that we all love. This photo was taken by one of his biggest fans, Sue Pinnow. Jake is not only a proven sire but he has won a CC and two Res CCs under breed specialists, these are Shelly Walker, Evelyn Hurley and Paula Stark. Frankie: Is a beautifully broken tri dog. 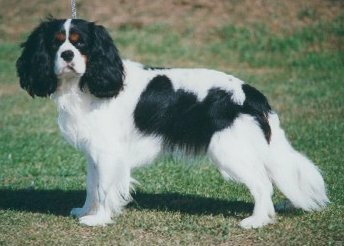 He has only been shown sporadically but will be hitting the show ring with a vengeance in the latter part of 2006. An exuberant dog we just need to get the ring behaviour sorted first.